The Brain Stimulation Headset, Valkee (http://www.valkee.com), substitutes the mood-elevating effects of the sun, by channelling safe bright light directly to photosensitive regions of the brain through the ear canal. Valkee has been proven to increase energy, and can act as a preventative or treatment of mood swings. Valkee has CE medical device certification and is clinically tested. London, UK – Wednesday 1st June 2011. 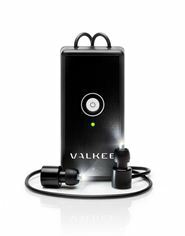 The brain stimulation headset from Valkee, a venture-funded, scientifically backed Finnish company, is now on sale in the UK, exclusively from the Valkee site (http://www.valkee.com). The Valkee light emitting earplugs prevent and treat mood swings, and circadian rhythm disorders, by bringing safe bright light to photosensitive regions of the brain. 8-12 minutes a day provides the needed amount of light daily. Valkee’s brain stimulation headset is based on new findings in brain science and bright light therapy. It has been studied since 2007 in the University of Oulu, Finland, by approximately 20 scientists cross-functionally in neurobiology, psychiatry and brain biology. In total, research has included over 350 study subjects, making it one of world’s largest programs in bright light research. In clinical studies, 9 of 10 experienced total symptomatic relief from severe tiredness and anxiety in ‘winter blues’. Valkee also supports improved cognitive performance at any time of the year. Valkee continues to publish its scientific results in leading scientific forums and publications during 2011, including advanced studies into the Valkee effects on PMS, ‘baby blues’, migraines, and Seasonal Affective Disorder. Valkee Ltd is a privately owned healthcare technology company, founded in 2007. Valkee specialises in innovative bright light technology and has developed a patent protected portable bright light headset.